LINCOLN, Neb. (Aug. 6, 2018) – It was labeled a year to “reinvent,” but the 2017 Nebraska volleyball team had other plans. “Nebraska Volleyball: Culture of a Champion” dives into the history of the rivalry between two powerhouse programs – Penn State and Nebraska – and goes on an inspiring journey filled with courage, determination, camaraderie and ultimately a championship. Many thought that 2017 would be a year of rebuilding. The previous season ended with a national semi-final loss, four starters – including three All-American players – graduated and both assistant coaches left the program. Coach John Cook As he started anew, head coach John Cook relied on his foundation of leadership and expertise, and returned to the fundamentals of the game. It was a bumpy start, but the underdog mentality became motivation for Husker volleyball to return to the national stage. The Final Four in Kansas City, Mo., featured Penn State and Nebraska squaring off in front of an NCAA record-setting crowd of more than 18,000 fans. The five-set battle to advance to the National Championship proved to be the ultimate test between the two teams looking to end their season with a title. 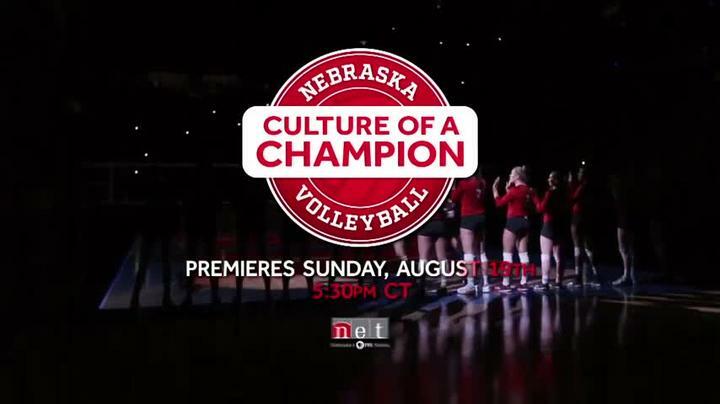 “Nebraska Volleyball: Culture of a Champion” repeats at 10 p.m., Sunday, Aug. 19; 8:30 p.m. CT, Tuesday, Aug. 21; 12:30 a.m. CT, Wednesday, Aug. 22; 8 p.m. Thursday, Aug. 23 and at 4 a.m., Sunday, Aug. 26. “Nebraska Volleyball: Culture of a Champion” is a production of NET Sports, Nebraska’s Home for Sports.